Apple introduced the EarPods with the iPhone 5 in 2012, to generally positive response — the clarity of the sound they reproduced was better than their predecessors (see “iPhone 5: The Best Yet, But Still an iPhone,” 26 October 2012). But no matter how well a set of earbuds or headphones might reproduce the sound they receive, even the most high-end headphones can do only that: reproduce an audio source. If you want to enhance the sound quality of the music you play on your iPhone, you’ll need to work on the quality of the signal sent to your cans. The iPhone’s native Music app plays music, and offers a few equalizer presets, but that’s all it does to your music. The $2.99 CanOpener — For Headphones, is an excellent, if awkwardly punctuated, app from GoodHertz that provides a significant boost to the iPhone listening experience. CanOpener’s primary trick is crossfeed. Listen to music on full-sized stereo speakers, and while you notice clear separation between the outputs of the two speakers, each ear also hears the opposite ear’s sound; your right ear, for example, hears the right-hand speaker’s signal loud and clear, but then, a fraction of a second later, also hears the left-hand speaker’s output. Headphones don’t provide this crossfeed without additional signal processing, and as a result, the sound you hear on even the very best headphones will sound slightly less rich and full than the music you can enjoy with full-sized speakers. 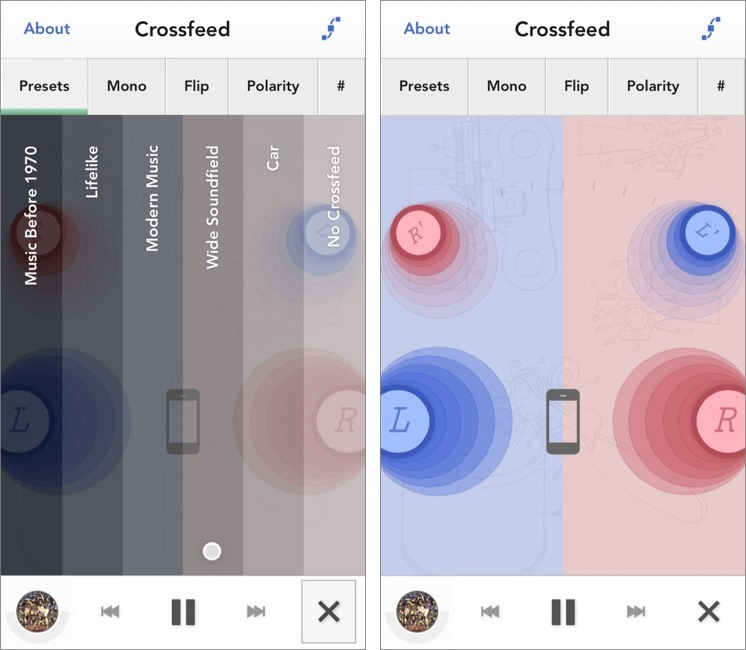 Crossfeed adds warmth, which is good for enjoyable listening, at the cost of crispness, which is more important for audio production. The enhancement that CanOpener provides is subtle but noticeable, especially on older recordings with a less dynamic soundstage than is standard today. As I write, I’m using CanOpener to listen to the marvelous Sympathy for the Devil, the Rolling Stones’ 1968 masterpiece, and I’ve selected CanOpener’s Music before 1970 preset. Keith Richards’s thrilling bassline fills the soundstage; Charlie Watts’s cymbals shimmer with clarity and sharpness; Mick Jagger’s sneering vocals spread over the full range of both speakers, lending a new dimension of malice to the song — the overall sound can only be described as richer and fuller. While there is, by definition, less stereo separation with crossfeed applied, the sound feels stronger, more powerful, more intense. CanOpener includes a bypass button; tap it and you can hear the song without any processing applied, and suddenly everything is a little duller — Keef’s bass stays firmly in the left channel, and there’s something missing in the middle. Other presets offer differing degrees of crossfeed: Lifelike reduces the extent of crossfeed, while Wide Soundfield simulates speakers placed further apart. Any of these effects can then be modified and customised further in a user-friendly interface, about which more presently. CanOpener also features a noise dosimeter to measure the sound pressure levels that are being applied to your ears as you listen to your music. 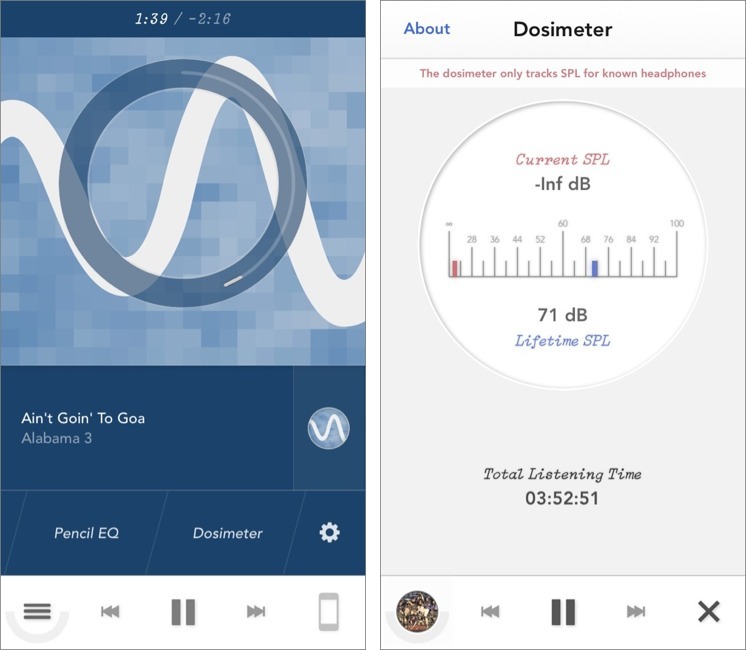 It tracks the current pressure level of your music, as well as the typical sound pressure levels you’ve exposed your ears to over the total time you’ve been listening to CanOpener, which the app also conveniently tracks for you. CanOpener also offers a well-designed and powerful graphic equalizer. Its presets contain half a dozen usual suspects: Bump is, essentially, a bass booster, while More Air and Brighter lift the high end to varying degrees. I tend to favour A Lil’ Mo Hi-Fi, which lifts both bass and treble. 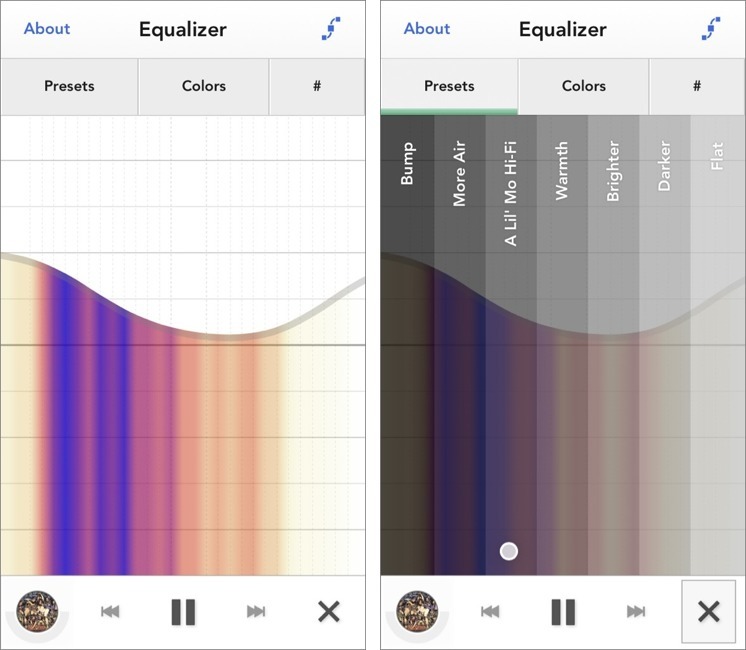 Pencil equalizer, a graphic equalizer with a drawing interface that marries sound-shaping with vector graphics, is powerful but available only as a $3.99 in-app purchase. While CanOpener includes only six presets, compared to the myriad options you can access via Settings > Music > EQ when you’re playing your music in the Music app, it has another significant benefit — you don’t need to leave the app to change your EQ setting. In addition to the Pencil equalizer, CanOpener offers two more features as in-app purchases, Speaker+ and Hi-Fi Pack. The Pencil equalizer allows fine tweaking of the app’s audio output, and many users will, I’m sure, find it a worthwhile purchase. It’s harder to make a case for the $2.99 Speaker+, which purports to enhance the output of the iPhone’s built-in speakers, but since I rarely listen to my phone this way, I’ve been unwilling to spend as much as the total cost of the basic app for one additional feature that seems to be of marginal utility. I’ve similarly shied away from the Hi-Fi Pack; I have no need for an add-on that claims to resample sounds recorded at a 192KHz/24-bit sampling rate. I’m happy with the boost my music receives from CanOpener, and I’m satisfied that it has been worth the $2.99 price, but in-app purchases that bring the total cost up to almost $15 seem significantly less essential. The Pencil equalizer at least offers three-minute trials before you buy; with Speaker+ and Hi-Fi Pack, you’re taking your chances sound unheard. CanOpener is almost as much fun to look at as it is to listen to. In equalizer mode, its spectrum analyser provides its information via colour, rather than the more typical waveform shapes. Navigating through a song is also unusual — scrubbing is done in a circular motion, rather than in a straight line, as though one were using an original iPod. A lot of thought has gone into the design of the interface of this app. CanOpener has full access to the music files on your iOS device, playing MP3, AAC, and Apple Lossless files. It can also — appropriately enough for an app aimed at music lovers looking to get the best sound possible from their music — handle FLAC files, setting it apart from Apple’s Music app. Add FLAC files to your desktop iTunes library and send them to your iPhone via a sync, and while the native Music app won’t know what to do with them, CanOpener will add a FLAC tab alongside those for artists, playlists and so on. What CanOpener can’t do is play streaming files, so it can’t work its musical magic on, for example, streamed music from iTunes Match, iTunes Radio, or independent services like Spotify, Rdio, and Pandora. There is a potential workaround for services that offer APIs — the app Djay, for example, can work with music from Spotify, so CanOpener’s developers could in theory incorporate a similar capability. It might seem a little strange to try to produce audiophile-quality sound with headphones connected to a smartphone or a tablet playing compressed audio files. But CanOpener does a surprisingly good job of wringing the last bits of detail out of a song, and as I listen, over my Sony MDR-V6 studio monitor headphones, to the Cowboy Junkies’ unspeakably beautiful Postcard Blues, from their wonderful 1988 album “The Trinity Session,” I can close my eyes and believe I’m in Toronto’s Holy Trinity Cathedral. It’s that good. Can it read the playlists I've created in iTunes? Can it do playlists at all?